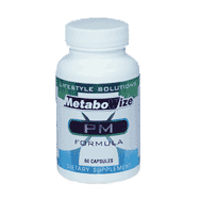 MetaboWize PM is a proprietary evening stress reducing sleep support formula. 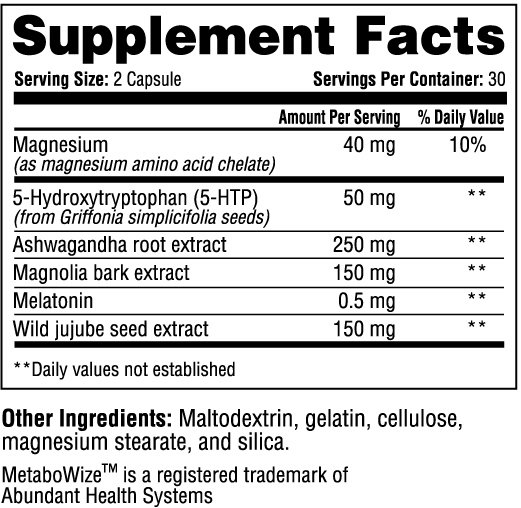 The MetaboWize PM Formula is an exclusive formulation of only the highest quality nutrients in synergistic ratios that act as anxiolytic (anti-anxiety and anti-stress) agents by helping control the body's primary stress hormone cortisol. Elevated cortisol levels are often associated with a dysfunctional metabolism, poor health and obesity. The MetaboWize PM Formula also contains nutrients that help to boost levels of the feel-good brain chemical serotonin, which is necessary for effective relaxation, deep sleep, craving control and fat loss. Sleep researchers from Cornell University have found that at least half of the American population is chronically sleep-deprived, the other half has trouble sleeping on most nights, and at least 56 percent of the US population complains about daytime drowsiness. Even mild sleep deprivation can cause hormonal changes that alter complex metabolic pathways responsible for: controlling appetite, food intake and the amount of calories we burn each day. Research presented in the Archives of Internal Medicine, shows that insufficient sleep decreases metabolism, leading to overweight conditions and even obesity. 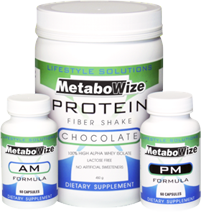 The MetaboWize PM Formula helps support a complete sleep cycle in order to facilitate better cellular repair, a healthier metabolism and more growth hormone production.